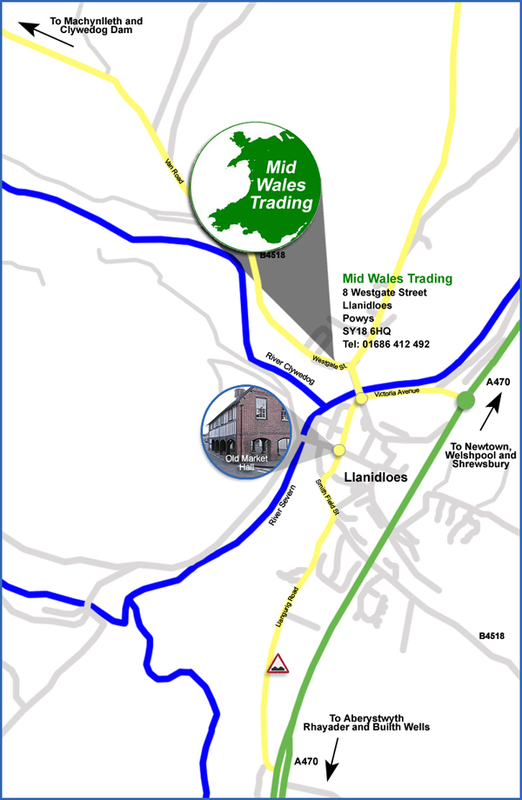 We are based in Llanidloes, Powys, Mid Wales use the post Code SY18 6HQ in a SatNav. Head out of Newtown following the Aberystwyth signs, about 15 to 20 minutes down the road and you will meet the Llanidloes roundabout, take a right and head down to the Mini Roundabout by Kevin Jones Cars take a right here over the Long Bridge and then immediatly a left just over the bridge and park up as soon as you can on the right hand side. We are no. 8 the new red and yellow brick built porch you will see a plaque on the wall outside. From the clock tower in Machynlleth head straight down the main street past the supermarket, a little further along the road you will see a Right Turn for Llanidloes, take this and head up the mountains and over the Golf Course. Keep going straight over the mountain roads, it is very scenic up on the top in the Summer, in the Winter the road can be closed and you have to follow the diversion. Keep going taking care over the bridge until you pass Dylife, where you will reach a T-Junction take the Right here sign posted Llanidloes. Follow this road all the way to Llanidloes passing the Clywedog Dam, and closer into town first the Red Kite Touring park, then the Clywedog Riverside Holiday Home Park as you pass here slow down as you come down the hill and as you see the Hafren Furnishers Budget Store on the Right and a T Junction with an Oak Tree park up on the left. Head directly inland following the Newtown, Midlands signs, this will bring you through Llangurig where you follow the Left for Llanidloes, about six miles down the road you will see a first Llanidloes sign out on the Bypass, ignore this one unless you are fond of speed bumps. Follow the road along to the island and turn left heading down to the Mini Roundabout by Kevin Jones Cars take a right here over the Long Bridge and then immediatly a left just over the bridge and park up as soon as you can on the right hand side.